A very easy to make vegan Chocolate Cake without a mixer. This is one of the easiest cakes to make as you just mix all the ingredients together. It does not contain any eggs, butter or milk which makes it perfect for vegans or those fasting, with high cholesterol or lactose intolerant or are allergic to nuts. Update 2019: The recipe has been updated with a vegan chocolate ganache on top as well as with a video and new photos. This picture is from my original post. I apologize for the bad quality but it was one of my first posts in 2007. When I decided to make this recipe again, in order to make a video and take better pictures, I decided to add a chocolate ganache on top. If you want it more “chocolaty” you can also add pieces of dark couverture chocolate or any other vegan chocolate or chocolate chips, in the batter. In the vegan ganache, just substitute heavy cream with coconut cream. Honey is not necessary. The ratio for a ganach is 1:1. For example, for 100 grams chocolate you add 100 ml heavy cream. For the vegan ganache with coconut cream, I found out that it is better to add more chocolate than cream i.e. 100 grams chocolate and 80 grams coconut cream. If you prefer this ganache sweeter, you can add icing sugar (confectioners’ sugar), to your taste. How can I make cake flour? If you do not have self-raising flour or cake flour, it is easy to make it yourself. For each cup of all-purpose flour (spooned and leveled), remove two tablespoons flour and substitute with two tablespoons of corn flour (cornstarch). Well, you don’t actually need to add, then remove and then add again. Just, add 2 tablespoons corn flour (starch) in your measuring cup and then fill it with all-purpose flour. Sift them together before using and your cake flour is ready! Why use vinegar in the cake? Do not skip adding the vinegar in the recipe, especially if you use water instead of orange juice. This is what will activate the baking soda and make your cake so moist and perfectly light! If you add orange juice instead of water, then you can skip the vinegar or add both. If you do not have red wine vinegar, you can substitute with white vinegar or apple cider vinegar. What oil can I use? In this recipe I have used a mild extra virgin olive oil. Well, Greece does have the best olive oil in the world and this is what I usually use for vegan desserts. A good quality extra virgin olive oil, adds a fruity taste to the cake. However, if the olive oil you use has a strong flavour, you can substitute it with any other vegetable oil or margarine. Put the olive oil and vinegar in a bowl and slightly beat with a whisk. Combine all the dry ingredients (except baking soda). Mix the baking soda in the orange juice and add it to the wet ingredients. Add all the dry ingredients to the wet ingredients and mix with a whisk. Grease and flour a 26 cm spring-form cake pan. Empty the batter in the baking pan. Bake cake for 55 minutes or until a knife inserted in the centre comes out clean. Set aside for 15 minutes to cool and remove from the cake pan. i made carrot cake and your chocolate cake…both very very nice indeed…you could hardly notice they were nistisimo. 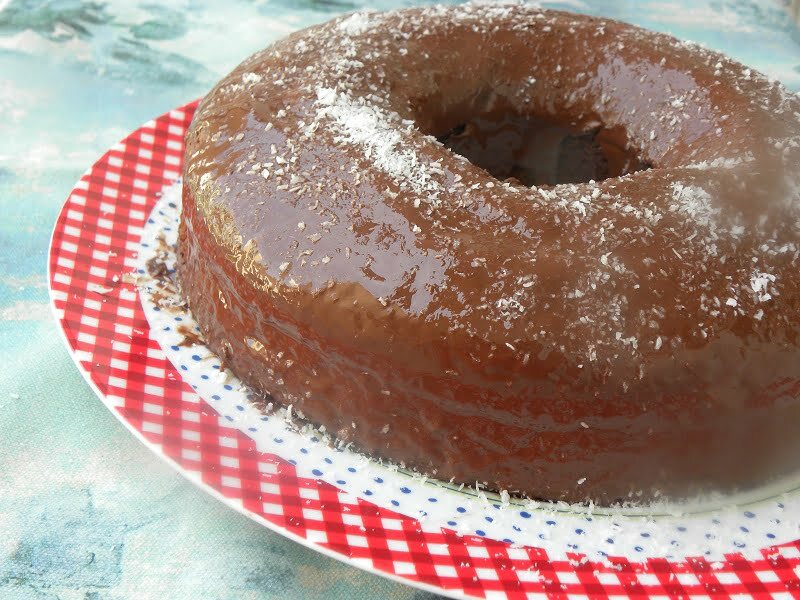 in choccolat cake i put 2 cups of orange juice instead of water and i added nuts and dry fruit marinated in brandy, for the topping i used orange juice mixed with icing sugar and cocoa powder…it was very nice …. Glad you enjoyed them Eva. Lovely idea adding the dry fruit as well as the orange glaze on top.